We’ve gotten good data coming over the CAN network through with beaglebones acting as ROS nodes. 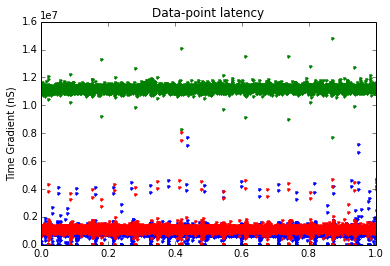 Here I’m going to take a look at what the data from the sensors looks like, and more importantly what kind of latencies in the data tx/rx exist. This analysis will allow me to begin designing the digital force contoller for each end-cap of SUPERBall. First we need to unpack data from the ROS CAN dump into message types. For the system ID process, we’ve set it up to have three message ID’s. 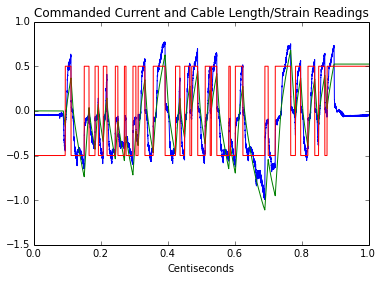 One for strain gauge measurements, one for cable length (read as position), and one for the commanded current in the system. Next we get the total time elapsed by taking the difference between the last and the first timestamp, for later use, and compute the one dimensional gradient of each message type to determine the longest update period. This value will tell me how quickly I can update a digital controller with some knowledge that I won’t be trying to close the loop on an old value. After my systemID work is done, some interpolation can be used to estimate what the next output will be of the system based off of its current state. This would allow me to run the controller a little faster and base the cutoff frequency off of the a smaller standard deviation rather than through analysis of a confidence measure which is as close to one as possible. The strain gauge latency is the only value that really matters, as all other values which will be used in the ID process are found on the motor-controller and will be known at every timestamp as long as the motor controller is on and functioning properly. # last and the first timestamp. # motorboard and don't require any CAN communications. 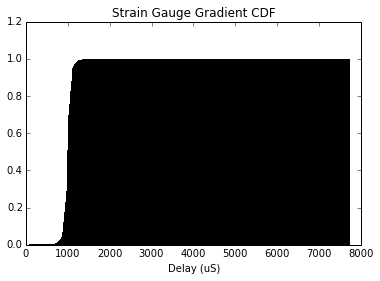 Now I’m going to plot interpolated values and filter the strain-gauge data under the worst-case-scenario conditions to emulate what the system would be like with a low-pass on the input with a cutoff of (1/maxStrain)/2, or the nyquist cutoff of the longest update period. #Making sure the scaling is correct: here. #This should equal close to .001 seconds. Now I output the data to a CSV to be used in MATLAB for system ID.